The experienced staff at Morris Animal Inn understands each dog has a unique personality. Our experience shows that the more interaction and activity pets receive, the healthier and the happier they will be. We offer and recommend the following activities to satisfy the needs of all our guests. Please call (973) 539-0377 for more information regarding our Activities Packages. Canine Cardio Sessions – A customized workout to tone muscle and burn fat. Sessions may include brisk walking, jogging or sprinting on our custom canine treadmill or on graduated surfaces. Workout will be varied based on age, stamina and endurance. “Business Walks” – Our standard, meticulously maintained elimination areas are located indoors. Business Walks are available daily for those dogs that prefer to eliminate in a natural surrounding. Morning, noon and evening walks can be scheduled to accommodate your pet’s familiar routine. Splish Splash Sessions – Great for splashing in the water, playing poolside, and chasing after toys for a fun dip in the pool! Sessions include a post-swim blow dry. 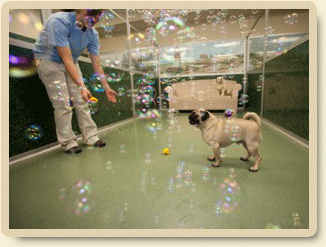 Sessions can be scheduled as an activity while boarding, grooming, or attending daycare. Bizzy Bonz – Entertainment and a tasty treat all rolled into one! Room service will deliver a strong rubber toy stuffed with a delicious, wholesome treat made right here in our kitchen. Tuck-In Service – Indulge your precious doggie with a bedtime tuck-in session. A healthy mint treat and bedtime story will prepare your dog for a night of peaceful sleep. Our Tuck-In Service provides the perfect ending to a busy day. Relax, Rejuvenate, Renew – Be sure to check out our full service Grooming/Day Spa menu as well. Calling All Paw-ty Animals! – We are ready to celebrate YOUR pet’s birthday in a group or private party when added to any service. Give us a call for more details.